I’m prepping my composter for spring, are you? I’ve written quite a bit about composting before. I am a serious composting nerd. I honestly can’t help myself. I just love it. We use our city-issued green bin quite a bit but I love our backyard compostor just as much. Why? Because veggie scraps and leaves = gorgeous garden soil that is free. FREE and GORGEOUS. The transformation never ceases to amaze me. This is why I’ve been easing back on the amount of refuse we toss into the green bin for the past few weeks. Every day we toss in a small mixing bowl full of egg shells, fruit peels, tea bags, coffee grounds, and the odds and ends of raw vegetables into the black bin instead. Sometimes I toss a handful of leaves and pour in a bucket of water from the rain barrel. It’s all very therapeutic for some reason. When the leaves start to collect fall a little more we’ll fill up the black bin and give the contents a good turn before it all freezes. And then when it’s time to do some gardening in the spring again we’ll have some amazing soil to use in our flower beds. It really can’t be beat. 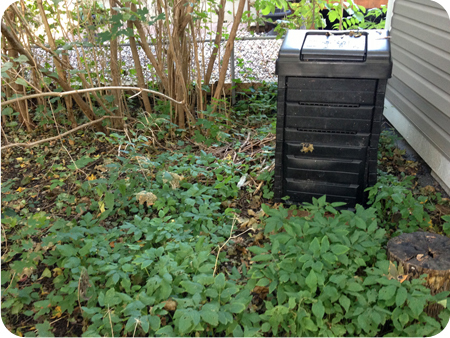 Share the post "I’m prepping my composter for spring, are you?" No Responses to "I’m prepping my composter for spring, are you?"